'Barbara Falk has made a distinguished contribution to the development of Australian education. Her outstanding academic ability has been evident ever since her time ·as an undergraduate. She has become internationally recognized as a pioneering leader in the teaching of university teachers to teach and, at the same time, in the study of the learning activities of university students. In her provocative and original contributions to educational thought, she has combined successful practice with rigorous analysis of educational theory. Barbara Falk was born in Melbourne in 1910, and was Dux of Lauriston Girls' School in 1928. She gained first class honours and first place in the School of History and Political Science when completing her course for the degree of Bachelor of Arts (with honours) in this University in 1932, and her Master of Arts degree was conferred in 1933. She studied sociology with Professors Mannheim, Laski, and Ginsberg at the London School of Economics, and psychology with Dr W. Stephenson at Oxford University. She completed the Diploma of Education at Oxford and studied child development at the Gessell Clinic at Yale University. 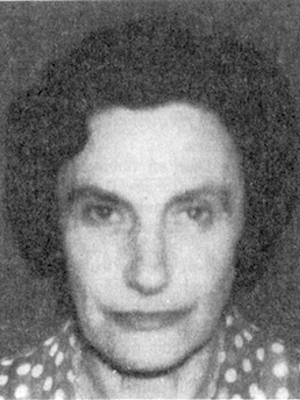 She returned to Melbourne after the Second World War, and, after a brief period as a remedial teacher, she was appointed in 1953 as Principal of Mercer House, the Associated Teachers' Training Institution. There, she was an imaginative and successful innovator. In 1960, Barbara Falk accepted appointment as Senior Lecturer in the Faculty of Education in this University. Her interest in teaching and learning problems in the University led in 1962 -to the establishment of a University Teaching Office. When this Office, the Education Research Office, and the Audio-Visual Aids section of the University were combined in 1968 in the newly created Centre ,for the Study of Higher Education, she was appointed foundation Chairman. She was made a Reader in 1970 and retired in 1975. Since then she has been a Research Associate in the Department of History. Barbara Falk's varied training and experience gave her a combination of humane, pedagogical and clinical skills which were particularly valuable for initiating and developing studies of learning and teaching in higher education. With vision and diplomacy she won the confidence and support of academics. She has the imagination and the talent to catch an idea and develop it in practice in the face of potentially suspicious or even hostile reactions. Her pioneering work in this University in the 1960s and 1970s gained attention in Australia and abroad. The Australian Universities' Commission praised the Melbourne development and encouraged other universities to emulate it. Barbara Falk advised on the establishment of similar units in Australia, in New Zealand and in England. With Kwong Lee Dow she wrote The Assessment of University Teaching, published by the Society for Research' into Higher Education in London. She took a leading part in the National Enquiry into Open Tertiary Education in 1973-74, having published with John Anwyl The Desirability of an Australian Open-Type University. Another interest of hers has been in educational problems in multi-cultural societies, and her 1978 Buntine Oration for the Australian College of Education, "Personal Identity in a Multi-Cultural Australia", has been published. In retirement, she has worked for the Schools' Commission, the Education Research and Development Committee, the Committee of Enquiry into Post-Secondary Education in Victoria, and the Academic Planning Board of Deakin University. She has been President of the Higher Education Research and Development Society of Australasia, President of the Victorian Chapter of the Australian College of Education and has been elected a Fellow of the College.